This year SAM@EKU sent student representative Glenn M. Cramer to attend the 2018 SAM’s International Business Conference in Arlington, Virginia. 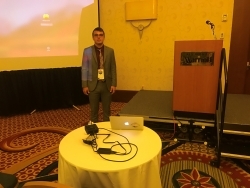 Glenn, a Global Supply Chain Management junior from Lexington, presented a student-faculty collaborated research and received positive feedback from Dr. Marcel Minutolo from Robert Morris University. The conference offered several networking programs where students had the chance to get to know other professionals and students across the world. During the luncheon the conference brought in Dr. Stan Targosz to talk about students debts; in another networking program, Dr. Kiersten Greggs gave a great presentation on key areas in drafting the resume, and how to improve the LinkedIn; then students engaged in a session of Resume Critique, and Glenn had the chance to sit down with Ms. Nicole Belyna to get personal feedback on his own resume. According to SAM faculty adviser, Dr. Qian Xiao, "Overall, SAM’s annual conference offers great learning experience, and helps students to come out of their comfort zone to reach out to professionals, and other students of different culture. Such experience and networking opportunities can have a real impact on students’ career." In the future, SAM annual conference is planning to expand on a new session of “internship and interview program” which will give students the opportunity to gain valuable applied experience and make connections. We encourage more and more motivated students to join us and participate in various activities we diligently work on. For more information about SAM@EKU, please contact the faculty adviser Dr. Qian Xiao at qian.xiao@eku.edu.